This Laser Purchase Order is formatted to be compatible with the ERA® dealer management software system. Each half of this business form is printed with the colors reversed so you can identify which part to distribute to the vendor. A center horizontal perforation allows separating the top half from the bottom half for distribution. This laser business form is printed on 20 lb. white laser compatible paper. 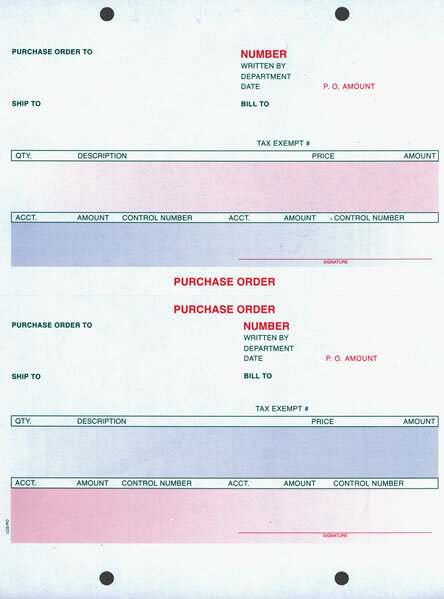 If your current purchase order looks like this illustration our form will align to your software perfectly. It can be purchased overprinted with your dealership personalization. This Laser Purchase Order form can be custom designed to match your current dealership form, or purchased now with the generic design pictured. To place a custom order, please call 866-348-6414. Ask about our FREE design service.